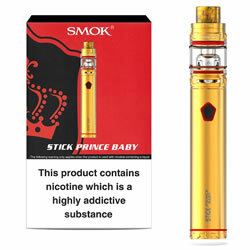 The latest SMOK PRINCE STICK BABY - GOLD FULL kit a powerful, pocket-sized vape pen that makes sub-ohm vaping easier than ever.fire key, and magazine release. New V2 S1 & S2 coils included. Buy from NUCIG UK.